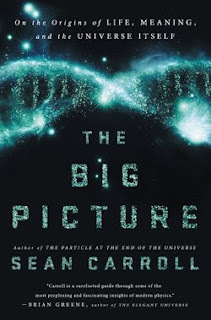 I just finished reading Sean Carroll's book "The Big Picture—The Origins of Life, Meaning and the Universe Itself". A review of this book fits in very nicely with where I was going in my last post and, at the end of it, gets us back on track again talking about life in the age of scarcity. Carrol, who is physicist, calls himself a "poetic naturalist" and this deserves a little explanation. There is only one world, the natural world. The world evolves according to unbroken patterns, the laws of nature. The only reliable way to learn about the world is to observe it. There is a trend these days for naturalists writing books to do their best to give a sound drubbing to those who believe in god, the supernatural and so forth and to blame religion for the world's problems. Carroll does not do this. He takes a very gentle, even handed approach, which probably makes this a great book for someone from a non-scientific background looking to see what science has to say about "the big picture". Of course, I am not such a person, but I did find much that will be helpful when trying to explain my position to such folks. And I suppose that, really, I am the ideal reader—someone with no formal training in science, but who is a "science watcher" and wants to up to date on the "big picture". The "poetic" part refers to the kinds of stories that we tell about that world. There are many ways of talking about the world. All good ways of talking must be consistent with one another and with the world. Our purposes in the moment determine the best way of talking. Modern physics has reduced the world to a collection of quantum fields and in principle the world can be entirely described by the behaviour of those fields. In practice, though, there are many "emergent" properties and behaviours that are not obvious from that low level description. Carroll takes us up through a series of higher emergent levels: particles and forces, bulk matter such as solids, liquids and gases, living organisms, and finally consciousness. He has some interesting things to say at each level, especially about consciousness, but I was somewhat disappointed that he did not carry on to talk about the obvious next level—the social sciences which deal with the emergent properties of people living together in groups. After a week of struggling with a nasty cold (it's that season again here in Canada) and trying to sort out which parts of this book to talk about, I've decided to skip directly to the last section of the book. What I'm leaving out are some very eloquent and cogent treatments of a variety of subjects that I find intensely interesting. But this is a significantly longer book than The Limits to Growth, which took me 6 posts to cover, and there are other books and other subjects that I need to get on with. Who knows, there is a wealth of material here and I may return to some of it on another day. In the meantime, have a look at the author's website for more information and then get yourself a copy of the book—you won't regret it. In Part 6, after spending almost 400 pages on how science works and what it can tell us about how the world works, Carroll takes an abrupt turn. One which very nicely wraps up the book for me. What follows is my attempt to condense his 46 pages into the 2000 or so words I have left to work with in this post. Leaving room for a few of my own thoughts at the end, of course. For naturalists, the evidence is pretty strong that there is no afterlife. The implications of naturalism are uplifting in many ways, but this is not one of them. A little rough calculation shows that each of us has about 3 billion heartbeats. What are we going to do with them? Meaning, morality and purpose are not built into the universe—they emerge as ways of talking about our human-scale environment. Though science tries to describe the world as accurately as possible, it has nothing to say about how we should spend our 3 billion heartbeats, the goals we should strive for or how we ought to behave. Our source of values is not to be found in the world outside, but inside us. We're part of the world but the best way to talk about ourselves is as thinking, purposeful agents who can make choices. One of those choices, unavoidably, is what kind of life we want to live. Rick Warren's book The Purpose Driven Life opens with the statement "it's not about you". Poetic naturalism says just the opposite: it is about you, me and every other person, it is up to us to create meaning and purpose for ourselves. The ascendance of naturalism has removed the starting point of much of how we used to conceive of our place in the universe. Like Wile E. Coyote after running off a cliff, we need some ground to walk on or we need to learn how to fly. Sure you can say you are leading a rich and rewarding life based on your love for your family and friends, your dedication to your craft and your work to the make the world a better place. But are you really? If the value we place on things isn't objectively determined and we won't be around in 100 years or so, can you say your life truly matters? Yes! The love you feel is still there, as pure and true as ever. If neither God nor the universe will help us attach significance to our actions, where do we start? With who we are—we are creature of motion and motivation. The dynamics of life manifests itself as desire and despite it's bad reputation, desire is what we have, it is about caring: about ourselves, other people, and what happens to the world. In the light of evolution, caring is what keeps us trying, we are built to care about the world and make it matter. As conscious beings we can build on our personal cares and desires to create values that look beyond ourselves to the wider world. The challenges are real, the opportunities are incredible and the finitude of life makes this particularly poignant. The thing is, you can't derive "ought" from "is". "Is" is descriptive, "ought" implies a judgment. A problem for naturalism is that the natural world doesn't provide judgment and different people will judge differently. Many have tried to derive "oughts" from logic, but they always end up cheating and sneaking in "ought" statements as premises, rather proving them from the logic. Sneaking oughts is often justified by saying, "oh it's only a little thing and we all agree about it anyway." But when we look closer we find that such premises are often major points of contention. We shouldn't hide or downplay the assumptions we make in order to get moral reasoning off the ground. Our attempts to be better people are best served if those assumptions are brought out into the open, interrogated and evaluated as carefully as we can manage. Some would use science to determine what morality should be. This boils down to something like "we ought to make the world a better place", and that all hinges on our definition of "better". Our definitions of better always comes down to some assumptions that are not based on observation of the natural world, and therefore can't be tested or falsified. Certainly, once we have decided what our goal should be, science can help us achieve it. The trouble is we don't all agree on what constitutes happiness, pleasure or justice. There are fundamental disagreements about meaning and morality which aren't just a matter of someone having made a mistake—they are real and inevitable. Other people do things that we judge to be bad, but we can't do an experiment or point to data or construct a syllogism or write a stinging blog post that would persuade them of why their actions are bad. The Bible tells us that God called Abraham to sacrifice his son Isaac. There are many interpretations of what Abraham (and Isaac) should or could have done. When it is not clear what is right and wrong, what are the most basic principles that should ultimately decide? Philosophers pose a thought experiment called "the trolley problem". A group of five people is tied to some trolley tracks. A speeding trolley has lost its brakes and is barreling toward them. If no action is taken, they will surely die. But you have the option of taking an action: you are standing by a switch that will divert the trolley to another track, which has a single person tied to it, who will surely die if you pull the switch. Such moral dilemmas are real, even if not usually quite so stark. An absolute moral standard like God can be very challenging, but the lack on one also leaves us with no guide to resolving such dilemmas. Nature alone is no help, it doesn't lead us to "ought", so what is the best way to think about how we should live? Two schools of ethical thought are consequentialism and deontology. Consequentialists believe that the moral implications of an act are determined by the consequences it causes, like "the greatest good for the greatest number". Deontologists feel that actions are morally right or wrong in and of themselves regardless of their consequences, that we should simply follow the rules. The two systems correspond roughly to different parts of our brains. System 1 is based on heuristics, instincts and visceral reactions and would have us mindlessly follow the rules. System 2 kicks in when we start thinking as consequentialists. In the trolley problem, System 2 would have us pull the switch and kill only 1 person rather than 5, while System 1 is appalled by the idea. Another thought experiment, the footbridge problem, involves pushing someone off a bridge to stop the trolley in order to save 5 people. MRIs taken of peoples' brains when faced with personal decisions (like pushing someone off a bridge) show activity in areas of the brain associated with emotions and social reasoning. Impersonal decisions like pulling a switch cause activity in the parts of the brain associated with cognition and higher reasoning. Clearly, the parliament that constitutes our brain has different factions. The real world is more complex and less clear cut and we may actually act differently than we predict we would. This discussion is meant to give us an idea of how we think about how we should behave. There is a third ethical system based on virtues, which is concerned with basing your decisions on the basic virtues such as courage, responsibility and wisdom. All three systems lead us to different conclusions in important situations. Which should we follow? "Should" implies we have a way of judging different approaches,. Let's think about how we could go about choosing any ethical system at all. Fortunately we have desires, feelings, things that we care about, things that attract us, things that repel us. Primatologists have done research that shows the basics of empathy, fairness and co-operation exist in monkeys and apes, showing that some of our most advanced moral commitments have very old evolutionary roots. One approach to moral philosophy is to think of it as simply a method for making sense of those commitments: making sure that we are true to our own self-proclaimed morals, that our justifications for our actions are internally consistent, and that we take into account the values of other people where appropriate. Rather than fitting data in a scientific sense, we can choose our ethical theories by how well they conform to our own existing sentiments. A moral framework is "useful" to a poetic naturalist to the extent that it reflects and systematizes our moral commitments in a logically coherent way. This is resolutely practical: it is what we do anyway when we try to think carefully about morality. It can also be terrifying when right and wrong is just a matter of our personal feelings and preferences, with nothing external to back it up. But admitting that morality is constructed, rather than found lying around, doesn't mean the there is no such thing as morality. This approach is known as moral constructivism. This is different from moral relativism, which thinks that morality is grounded in the practices of a particular culture and can't be judged from outside. A constructivist acknowledges that morality originates in individuals and societies, but accepts that those individuals and societies will view their beliefs as correct and judge others accordingly. Just because moral are constructed, doesn't mean they are arbitrary. Ethical systems are invented by humans and we can all have productive conversations about how they can be improved. Different constructivists have reached different conclusions. Immanuel Kant was a strict deontologists, and held that every rational person would ultimately construct the same moral framework. David Hume was more at home with skepticism, empircism and uncertainty. Hume held that "Reason is and ought only to be the slave of the passions." From a naturalistic viewpoint, Hume was right: we have no guidance on how to distinguish right from wrong: not from God, not from nature, not from the pure force of reason. But we are burdened and blessed with the talents, inclinations and instincts that evolution and our upbringing have bequeathed us. Judging what is good and what is not is a quintessentially human act. We need to face up to that and still remember that other people may not judge the way we do. What kind of morality shall we construct? If we choose to be consequentialists, we could try the theory of ultilitarianism. But we quickly find there are problems with defining ultility and with applying it, even in principle. If we choose to be deontolgoical, we must be aware that psychologists have found that most moral reasoning and rule based reasoning in particular, serves to rationalize opinions we hold intuitively, rather than leading us to novel moral conclusions. Clashes between moral guidelines and our personal moral sentiments would be okay if we though the guidelines captured some transcendent truths—so much the worse for our sentiments. But if the project of moral philosophy is to systematize and rationalize our sentiments, then such approaches have a big problem. All the various systems of ethics capture something about our moral impulses. We want to act in good ways, we want to make the world a better place, we want to be good people. We also want to make sense and be internally consistent, which is hard to do while accepting all these conflicting impulses at once. Moral philosophies tend to pick one approach and apply it universally, which leads to conflicts. Instead, perhaps we should take the bits and pieces from all the systems that fit us best. There is no "right" answer to the trolley problem, how you should act depends on who you are. The worry is that if morality is constructed, everyone will construct whatever they like, and what they like won't be very good. Or worse yet, that we won't have any strong basis to reject things that are clearly bad. But in practice such worries are overblown. Most people, in most circumstances, want to think of themselves as doing good rather than evil. If we disagree with them, we can sit down and talk and work out a mutually reasonable solution. And if we decide that something is deeply wrong, there is no reason we cannot work to prevent it happening. Deciding how to be good isn't like solving a math puzzle or discovering a new fossil. It's like going to dinner with a group of friends. We think about what we want for our individual selves, talk to others about their desires and how we can work together, and reason about how to make it happen. The group may include both vegetarians and omnivores, but with a good faith effort there's no reason everyone can't be satisfied. Here is the early twenty first century, a majority of scientists and philosophers are naturalists. But in the public sphere, at least in the US, on questions of morality and meaning, religion and spirituality are given a preemminent place. Our values have not caught up to our best ontology, our current understanding of how the world works. They had better start catching up. We're like that first fish flapping up onto land, faced with a new world of challenges and opportunities and not yet adapted to it. We are faced with moral questions our ancestors couldn't have contemplated. Poetic naturalism doesn't tell us how to behave, but it warns us away from the false complacency of the conviction that our morals are objectively the best. We don't need an immovable place to stand; we need to make our peace with a universe that doesn't care what we do and take pride in the fact that we care anyway. A good poetic naturalist will resist the temptation to hand out lists of Ten Commandments, but perhaps a list of Ten Considerations would be appropriate. Each comes with a few paragraphs of explanation and they are definitely worth reading. Carroll was brought up religious and studied astronomy as an undergraduate at a Catholic university. None of this experience was in the least repressive—he wasn't driven away from religion as so many of us have been. He was always curious about the world and fascinated by science, We talk about awe and wonder, but they are two different things. He is in awe of the universe, but his primary feeling is wonder. Awe implies reverence of a mystery and wonder implies curiosity and an urge to figure it all out. Carroll feels it is a mistake to embrace mystery for its own sake, to take refuge in a conviction that the universe is fundamentally inscrutable. He always thought it was crucial that different aspects of the world fit together and make sense. Thinking like this eventually led him to abandon his belief in God. But for him the important distinction is not between theists and naturalists, but between those who care enough about the universe to try to understand it and those who fit it into a predetermined box or simply take it for granted. It's us against the mysteries of the universe; if we care about understanding, we're on the same side. For poetic naturalists the universe is not a miracle. It simply is, unguided and unsustained, manifesting the patterns of nature with scrupulous regularity. Over billions of years it has evolved naturally, from a state of low entropy toward increasing complexity, and it will eventually wind down to a featureless equilibrium. We are the miracle, we human beings. Not a break-the-laws-of-physics kind of miracle; a miracle in that it is wondrous and amazing how such complex, aware, creative, caring creatures could have arisen in perfect accordance with those laws. Our lives are finite, unpredictable and immeasurably precious. Our emergence has brought meaning and mattering into the world. All lives are different, and some face hardships that others will never know. But we all share the same universe, the same laws of nature, and the same fundamental task of creating meaning and of mattering for ourselves and those around us in the brief amount of time we have in the world. Three billion heart beats. The clock is ticking." And now for my thoughts. I am truly impressed with Carroll's ideas on morality and meaning. Even hacked down to their bare bones, as I have presented them here, I think they hang together quite well. I have only a couple of minor quibbles. Philosophers tend descend into binary thinking when trying to clarify issues. The trolley problem is all very well as a thought experiment, but in the real world it would very likely be possible to mess with that switch in such a way as to derail the trolley and bring it to a halt saving all six people. Could be pretty hard on the trolley, but I care more about the people. My point, though, is that there is usually a third way out of these dilemmas (if not a fourth, fifth, sixth...) and that is what we should be hunting for. As a practicing scientist Carroll has a pretty good grasp of objective reality. He made it clear in the first five parts of the book and took it for granted in the sixth. This, I think, contributed much to the clarity of his reasoning about ethics. But a great many people have no such grasp of objective reality and believe what their ideologies tell them to, however wrong that may be. This is a peril that Carroll warns us of repeatedly. While it is true that science can't give us answers to our questions of how we ought to behave, if our ethical reasoning is not based on a solid grounding in how the world works, it will inevitably go astray. If we are fundamentally wrong about what the consequences of our actions will be, then our moral judgments will be faulty. It is interesting to ponder how this all applies to what I've been talking about on this blog. Today "Business as usual" forges ahead, in denial about climate change, resource depletion and the fundamental faults of its economic system. The consequences of this loom large before us. There is a clear moral obligation to acknowledge those consequences and act accordingly. At the same time, for many who do see those consequences (I call them "Crunchies) there is a reluctance to accept much of what science tells us because science is seen as being in league with the forces of "business as usual". This is another form of denial and just as crippling as the denial at the other end of the spectrum. What I am trying to do here is to point both Business as Usual folk and Crunchies towards a reality based approach to life in this age of scarcity. I am well aware that this is rather cocky of me and somewhat of an exercise in futility as well, but I'm having fun with it, so what the heck. Thanks for the recommendation, Irv. I just bought it for my Kindle. I'm wondering if morality is an emergent property of the type of brain we humans have and if so, is it adaptive, or is it totally constructed (I suppose you have to have a brain capable of constructing in the first place.) I'll read the book with interest. I love big picture stuff. I don't agree that it's cocky of you to try and point the way to a reality-based approach to life, but having had little success at it myself, I tend to see it as rather futile. Still, we keep trying. Thanks for all the work you put into these posts. Nice to hear from you again, Bev. At least, I deduce form comments on your blog that you name is Bev. Sorry if I am intruding on your privacy. Not intruding at all, Irv. Please comment any time. Most of the blog is about food-growing, but I'm trying to introduce a few extra ecological/energy-type concepts. I wrote up a lengthy comment to you blog post about sustainability, but it wouldn't post. Possibly because it was too long. Here it is below, assume it worked here. Let me know what you think. Bev, it sure is nice to see someone else getting worked up about sustainability. When I was reading your blog post yesterday, I actually had a bit of an epiphany. This combines the idea of sustainability with the other idea that the "balance of nature" is a myth. Here a paragraph from Amazon's blurb: "The idea of a balance of nature has been a dominant part of Western philosophy since before Aristotle, and it persists in the public imagination and even among some ecologists today. In this lively and thought-provoking book, John Kricher demonstrates that nature in fact is not in balance, nor has it ever been at any stage in Earth's history. 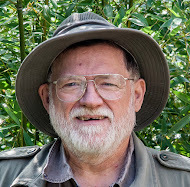 He explains how and why this notion of a natural world in balance has endured for so long, and he shows why, in these times of extraordinary human influence on the planet's ecosystems, it is critical that we accept and understand that evolution is a fact of life, and that ecology is far more dynamic than we ever imagined. " This would imply that our hunter gatherer ancestors were not living in balance with nature, and I would say that their lifestyle was not sustainable either. Certainly, it was less harmful than our modern lifestyle. But when they over hunted or gathered an area, they moved on. Or when their population grew to more than what an area could support, some of them would move on. This process saw them spread from Africa to all the continents except Antarctica, and finally to the islands of the Pacific. This took at most a few hundred thousand years. Hardly what I what called a balanced situation, and those folks weren't even trying to maintain a "growing economy" the way we are. People react differently to this idea. Some ignore it altogether and believe that if we went back to being "noble savages" everything would be fine, at least for the small remaining number of us. Others accept the idea and conclude that there is no hope--that mankind is a plague on the earth and nature would be better off without us. Others, like me, think that it may be possible to achieve an approximately stable situation. Call it sustainability and recognize that it is NOT natural. But so little we do is "natural" anyway, so I don't see that as a problem. Yes, this would work better with a lot fewer people. What scares me most is that a hundred years from now, when the dust has started to settle from the collapse, people will pull themselves together and try to get economic growth started again. Clearly, the worst thing we could do. Better to try to set up a sustainable way of living.